Birds can land so precisely because they make use of what is called ‘Stall.’ This is the point in which the angle of attack increases beyond a certain point such that the lift begins to decrease. As a bird approaches its perch, it will tilt its wings back at a sharp angle, raising its body, spreading its tail to create drag, and spreading out its wings to slow down. The alula, a small projection on the forward edge of the wing, helps them to land without stalling. Functioning in the same way as the slats on the wings of an aircraft, the bird can move its alula slightly upwards and forwards, creating a small slot on the wing’s leading edge. This allows the wing to achieve a higher than normal angle of attack and, forcing air over the top of the wing, helps maintain lift as it slows down to land. In the case of an airplane, however, its wings are never more than a few degrees away from level, for fear of stalling and falling out of the sky. Within this narrow range of angle, the airflow is much smoother and regular, as opposed to the whirlwinds and vortices that are created when a bird lands at such a sharp angle. Is there a way that our airplanes can be designed more like birds and use stall to our advantage? According to researchers at the University of Illinois and MIT, this could eventually come to be. Both Universities have delved into this idea, creating gliders and aerial robots that can perch on things as small as the human hand, or even a suspended string. A rapid pitch-up to a post-stall angle of attack with an immediate climb and rapid deceleration. Researchers at MIT have demonstrated this using a foam glider with only a single motor on its tail to land on a suspended string. They accomplished this using a set of error-correction control system that prods the glider back into trajectory when location sensors determine it had deviated from it. As mentioned before, a plane, when trying to slow down, cannot tilt too far back for fear of stall. However, because this control system takes advantage of stall, when landing, the glider has a drag coefficient that is four to five times that of other aerial vehicles. When watching the video shown below, you are able to see the glider sharply pull up and land on the string in very much the same way that a bird would. Robotic planes could be designed with an improved maneuverability and it could potentially allow them to recharge their batteries merely by perching on power lines. This method allows for quick changes of speed and fast landings, therefore improving future aircrafts’ landings. 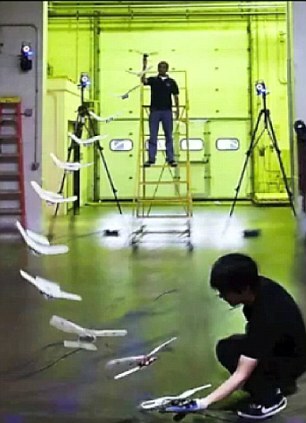 The slow-motion video of the perching model-airplane is very nice, but it looks scary (for a people-carrying aircraft).